DFRobot I2C ADS1115 16-bit ADC module can accurately collect and convert analog signals. 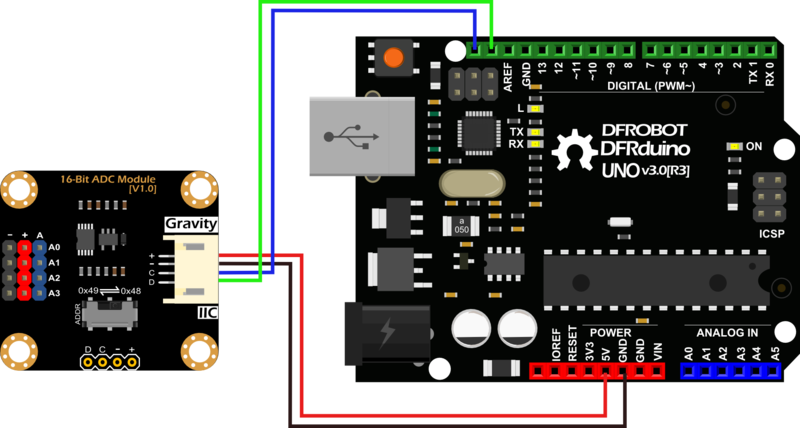 Through this ADC module, Raspberry Pi can easily use a wide range of Gravity series analog sensors to measure various signals, and perceive this world. Raspberry Pi is a common master control board which is powerful in its functions, but the I/O pins of Raspberry Pi can read digital signals only, what's more, only through an external analog-to-digital conversion (ADC) module can it read signals of analog sensor or device, it is not convenient to use. 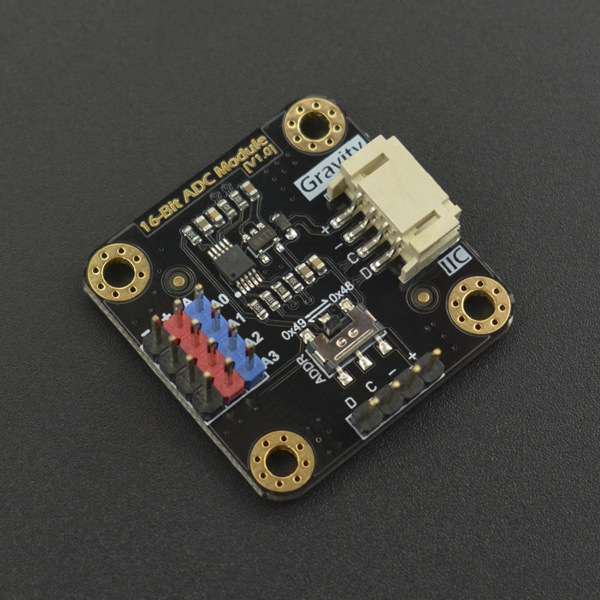 DFRobot I2C ADS1115 16-bit ADC module is specially designed for Raspberry Pi and Gravity series analog sensors, which greatly reduces the difficulty of using the Gravity series analog sensors, plug and play, no welding, very convenient. The number of Gravity series sensors is large and its wide variety can meet the needs of various sensors of the Raspberry Pi. This module uses 16-bit ADC chip ADS1115, supports 3.3 ~ 5V wide voltage power supply. The chip has a precision reference voltage and programmable gain adjustment (PGA), therefore, accurate acquisition and conversion can be performed for both weak and highly variable signals. So it is also applicable to all types of applications that the main control board needs to accurately collect the analog signals. One ADC module can read analog signals of 4 channels. Because of the on-board I2C address selection switch, it supports the cascade of two ADC modules and can read analog signals of 8 channels, it can satisfy the needs of various applications. This tutorial will demonstrate how to use the ADC module to read 4 channels analog signals with the Arduino board. Please switch the I2C address to 0x48. 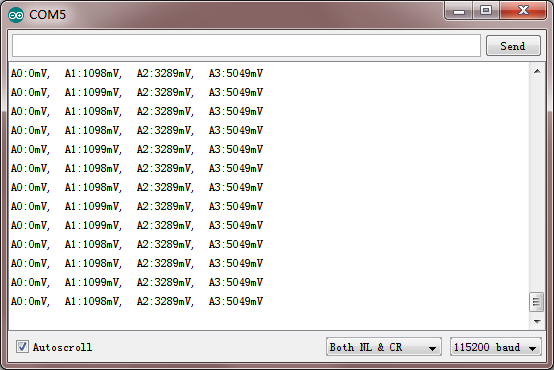 * The voltage value read by A0 A1 A2 A3 is printed through the serial port. 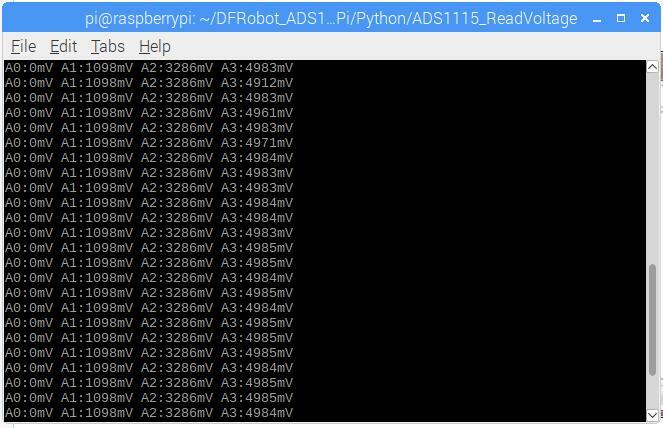 This tutorial will demonstrate how to use the ADC module to read 4 channels analog signals with Raspberry Pi. Please switch the I2C address to 0x48. 1.Open the Raspberry Pi I2C interface. If it is already open, skip this step. Then use the up and down keys to select “5 Interfacing Options”, press Enter, select “P5 I2C” and press Enter to confirm “YES”. Restart the Raspberry Pi. 2. Install the Python related libraries and git, then Raspberry Pi requires networking. If it is already installed, skip this step. 3. Download the driver and run. In the terminal, type in the following commands in order, and press Enter. Q1. How do these two ADC modules cascade? Any sample code? A1. If cascade is needed, you need to set the I2C address of one ADC module to 0x48 and the I2C address of another ADC module to 0x49. Connect the two ADC modules to the I2C bus interface of the main control board. 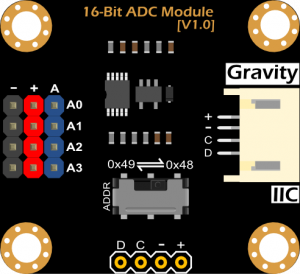 Get Gravity: I2C ADS1115 16-Bit ADC Module (Arduino & Raspberry Pi Compatible) from DFRobot Store or DFRobot Distributor.